Let me ask you a question. "How old is your hard drive?" Why you ask? It is my feeling that the design engineers are looking at a 5 year design lifetime when drive is on the drawing board. Many drives last quite a bit longer and as some of us know from experience, quite a few drives don't last that long. If your hard drive is 4 years old or greater then it might be time to think about backing up your data and moving it to a new hard drive. It is usually a fairly simple job to transfer everything (usually by a process known as imaging) from one drive to another as long as the original drive is working properly. When this procedure works it is a thing of beauty. When you reboot your computer after the hard drive swap you should find that everything looks and works the same except that you have a new hard drive holding your precious data. Your motherboard can fail, the power supply can fail, the sound card, the network card, the DVD can fail and you can still get your data back. If your hard drive fails then you are in trouble, your data is gone. Then it's time for the old techie joke, "you will just have to restore from your backups". The joke here is that the old techie knows there are probably no backups. Very dark humor for sure. 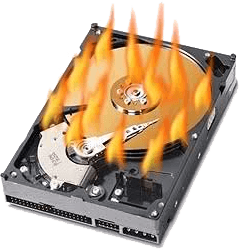 It is worth noting that there are services that go to extreme lengths to retrieve valuable data on dead or failed hard drives. It is also worth noting that these services are extremely expensive. The really important thing on a computer is the data you have saved on to it. The next two important things on it are the configurations that we do for programs, passwords, codes etc. The issue here is that these configurations were possibly done years ago, who remembers. The other important type of info on our computer is the installed programs and various theirs codes and activations. I have seen many people have to re-purchase applications because of lost disks, codes or install files. All three of these types of data are stored on your hard drive. There are certainly some types of hard drive failures where the drive does not completely stop working and it is possible to pull some or all the data off but since the drive is not working 100% the ability to transfer the entire drives contents to a new drive often won't work. What you are left with is a much larger job of re-building your computers. Fresh OS install, install and configure programs ( find the disks and codes too), install printers, restore data etc. It's a lot more work than imaging from one drive to another. From experience I can tell you that recovering from a hard drive failure can be huge pain in the rear and lots of work. Why bother when a little preemptive maintenance can save you all that bother. We all take for granted the wisdom of replacing the tires on our car before they blow out while we are driving. It is an odd phenomenon of the computer age that people who are totally tied to their computers rarely give them a mechanical thought until they stop working. Failure over a long enough timeline is a absolute certainty. To make it interesting we do not get to know how long the time line is. Best be prepared sooner than later. Pour chicken broth, lobster broth & wine into a large pot. Bring to a simmer and cook until reduced to about 2 1/2 cups, 25 - 30 minutes. In a Dutch oven over medium heat, saute bacon, stirring occasionally until crispy and browned, 3 - 4 minutes. Add onion, carrots, celery, peppers and corn kernels and saute stirring until tender, 4 - 5 minutes. Add broth to Dutch oven, add cream and sherry and bring to a simmer. Stir in potatoes, return to a simmer and reduce heat to a medium-low. Cook until potatoes are tender - about 15 - 20 minutes. 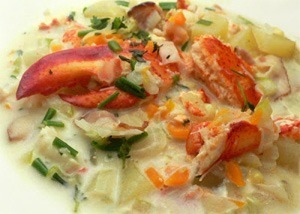 Stir in lobster meat, salt, pepper, thyme and 1/2 the chives. Cook stirring occasionally until lobster is heated through, 2 - 3 minutes. Adjust seasoning as needed. *Includes a provision of $.35 for a slice of garlic crusty bread.